Father Robert Barron, a priest of the Archdiocese of Chicago, is a pioneer in the use of the Internet to evangelize those who have no faith or have left the Christian faith behind. He is a professor of faith and culture at St. Mary of the Lake/Mundelein Seminary in Mundelein, Ill., and is the founder of Word on Fire Catholic Ministries. Through Word on Fire, Father Barron has produced and posted on YouTube scores of six- to eight-minute videos in which he comments on various happenings in popular culture—movies, books, newsmakers, etc.—in light of the Catholic faith. Admittedly, many of the comments that he receives are negative from viewers who criticize the Church, the priesthood or him directly. But Father Barron likens this reception to the way in which St. Paul was received when he preached the Gospel in the Areopagus, a public square in ancient Athens, Greece. “Everything is on display [there],” Father Barron said. “Every philosophy, every idea is on display. And Paul announces Jesus Christ risen from the dead. And it says that most people laughed at him and walked away. In the same way, Father Barron occasionally receives e-mails from those viewers of his YouTube videos who may have started off skeptical of the faith but, after watching him, began to change their minds. Research done at Word on Fire has found that the typical viewers of YouTube videos are unchurched young adult men in the mid-20s. 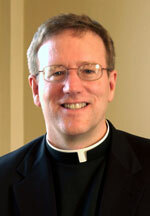 “The Church needs to reach out, especially to that generation,” Father Barron said. “How else would you engage a secular-minded, maybe anti-ecclesial 25-year-old male? How else would the Church do that?